Head on over and print your coupon for 40% off any Regular Priced item at Hobby Lobby through January 7th. 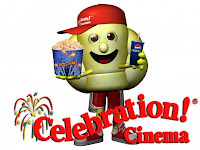 select Celebration Cinema theaters for just $4 or less! Today's deal from Housewares Deals is this 8-Piece Healthy Lunch Set from Design for Living for just $15. This 8 Piece Healthy Lunch Set lets you keep food and drink fresh on the go and makes storing easier. The Design for Living Stackable Tritan Water Bottles are constructed of durable, food safe Tritan plastic, which will not retain odors or tastes. They stack neatly in the fridge or cabinet. The Microban Polypropylene Food Storage Containers have Microban antimicrobial protection built in to help prevent odor causing bacteria. The lids feature locking tabs to seal in freshness and prevent spills. 8 piece set includes 16 ounce green bottle, 16 ounce blue bottle, 3/4 cup container with lid, 3-1/4 cup container with lid, and 5 cup container with lid. 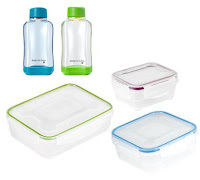 All items are dishwasher safe; containers are also freezer and microwave safe. 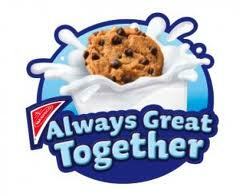 Hurry over and "like" Nabisco on Facebook and head to the “Cookies & Milk” tab on their Facebook page so you can save $1.00 on Nabisco cookies when you buy a package of Nabisco cookies and one gallon of milk. Today only, the Disney Store is offering FREE Shipping with purchase of New Arrivals when you apply promo code SHIPNEW at checkout. 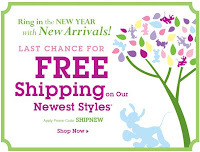 In addition to the free shipping offer, Disney Store is also having their Twice a Year Sale! 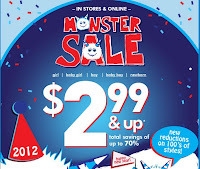 The Children's Place Monster Sale is going on right now! With lots of items priced at just $2.99 and up plus FREE Shipping on all purchases, you're sure to get a great deal. Make sure to use promotional code U4F2011 to take an additional 15% off already reduced prices!